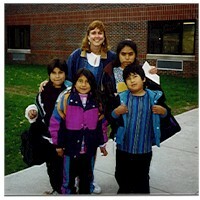 School Social Workers assist children to overcome problems that affect their social, emotional and academic development. They provide supportive services to students, parents and school staff. Children receive individual or group work counseling and also participate in classroom problem solving and cooperative education programs. Our 5th and 6th grade students have been participating in a Community Learning Service Project. Once a month they go to the St. Joseph Church Community Food Pantry and lend a hand. On the last Thursday of each month, four 5th graders help adult volunteers unload, unpack and set up food and other household necessities that will be available to less advantaged families in the community. On the next day, four 6th graders help carry out the distributed goods to the recipients cars. This is especially helpful to senior citizens and mothers with young children in tow. The retired volunteers at the Pantry are extremely delighted to have our young helpers ease their tasks, and our students gain important social awareness and insights into our small community. They are learning to give and think beyond themselves. The students find this to be a very rewarding experience. Read some of their comments for yourself. The Safety Patrol Program has been reinstated at Onekama School this year, and it's a success. The Safety Patrollers are both responsible and independent. The Patrollers include Betsy L, Danielle L, Emily G, Kellen S, Megan M, Patrick OS, and Sara W. Four people work in the morning and four in the afternoon. In the morning they watch busses and crosswalks. They start morning patrol at 7:45 AM. The afternoon group starts at 2:50 PM. They do not complain about having to get out of school 10 minutes early! They say it is just their duty. We think the Safety Patrol is a good addition to our school. During Kindness week, students were encouraged to think of others.